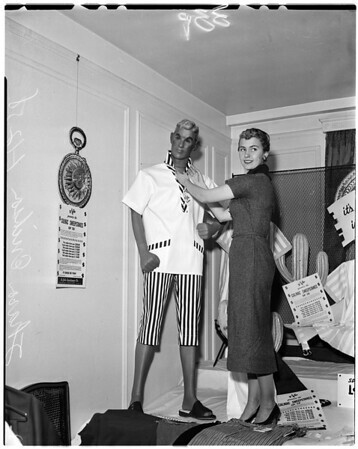 Men's wear spring and summer show at Biltmore, 1958.
red white & trim. 23-24: Leo Frankenstein in gray and black sport shirt and vest combination. 25-26: Stan Pearlman models gray three dimension cloth jacket. 27-28: Buyer Lee Schertzer, of Burbank, models blazer of wool and silk, narrow lapel, brass buttons".